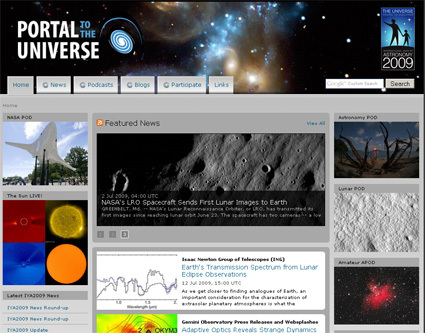 The Portal to the Universe (PTTU) provides a global, one-stop portal for online astronomy content, serving as an index and aggregator for astronomy content for laypeople, press, educators, decision-makers, scientists and more. In its first month of operation PTTU had more than 40 000 unique visitors. The site itself features news, blogs, video podcasts, audio podcasts, images, videos and more. Web 2.0 collaborative tools, such as the ranking of different services according to popularity, help the user to sift constructively through the wealth of information available and promote interactions within the astronomy multimedia community. A range of "widgets" (small applications) have also been developed to tap into all sorts of existing "live data", such as near-live pictures of the Sun, live positions of spacecraft or live observations from telescopes. to users, as well as indexing and archiving, collecting and maintaining a central repository of useful information. Modern technology such as RSS feeds and standardised metadata make it possible to tie all the suppliers of astronomy information together with a single, semi-automatically updating portal. The result is a technologically advanced site that brings together strands of astronomy content from across the world wide web.